To me, this is one of the best Albums by the band ASP in years. Not only is it (once again) a totally different story than the ones told by the releases belonging to the "Schwarzer Schmetterling" and "fremd" album cycles; it is also a rather experimental album, somewhat like the music they did in the beginning, but on a totally different and more professional level. While the first song is still a typical ASP song, that could have been released on any other album, already the second song is somewhat different to any song before, even though you can still make out typical ASP elements. However, with the third song, ASP provides the first song of many that are pretty courageous for a gothic album: A minimalistic and melodic song, fast percussions, violin and a harmonica(!) are the main instruments that play the rythm of a train. After this fast song, another melodic song follows that is totally dreamy. Then comes a metal song, that is typically ASP and that musically fits perfectly into the "fremd"-cycle, and after that: A french tango! On a gothic album! And it's perfect. Absolutely ingenious. There are a few other songs, some typically ASP, and even a "Speech-Part" that reminds you of the Requiembryo. All in all it's the most varying album with the greates number of different styles and music instruments of any album that ASP ever made. Also emotionally it's a little rollercoster between ups and downs. It is also the most explicite story telling album. I guess creating this took everything from the band, and fortunately they really excelled - to me, this is the best album and it's totally perfect. I know that there are a number of people that are a bit disappointed, especially if you expect something like the last albums. However, if you are open to experiments, if you like storytelling, and if you are open to different styles of music, this will probably be fun for you to listen to. So far for the music. 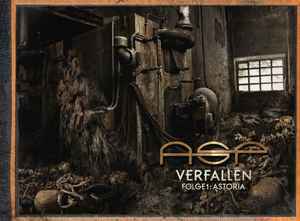 As I already mentioned, all songs are part of one great story that lineary tell the story of a guy that leaves Berlin after the war in 1915 to find his luck elsewhere; unfortunately he finds it in the luxury "Astoria" hotel in Leipzig where he starts as a janitor. While first everything seems perfect, we soon find out, that the hotel has a will of its own and makes the protagonist do more and more questionable and in the end even criminal things. The story is equally thrilling as is the one in the music (that acts as a prequel); Kai Meyer is a great author that knows how to write storys that will unfold as a movie inside your head. However, that not being enough, ASP also engaged Joachim Luetke for the artwork, an artist that has already done artworks for famous bands such as Dimmu Borgir, Kreator or Marilyn Manson, and who is often comapred to H. R. Giger, the designer of the Alien movie franchise. 72 pages are filled with artwork by Joachim Luetke and the story of Kai Meyer, all exclusively for the limited edition of this release. And as a final bonus, a four track bonus CD is included, having two songs from the M'Era Luna concerts, as well as two readings by Kai Meyer from other books of his.